Joanne Calderwood seemed right at home when she defeated Kalindra Faria at UFC Fight Night 135 in August. “JoJo” put on one of her best performances in the octagon as she defeated the Brazilian fighter by first-round submission. One of the reasons Calderwood had so much success in that fight was her competing at her natural weight of 125 pounds. Once the women’s flyweight division was in full swing this year, The Ultimate Fighter season 20 competitor jumped at the opportunity to compete in this new weight class. It’s a change that Calderwood says not only has made her healthier during fight camp but also in her everyday lifestyle. 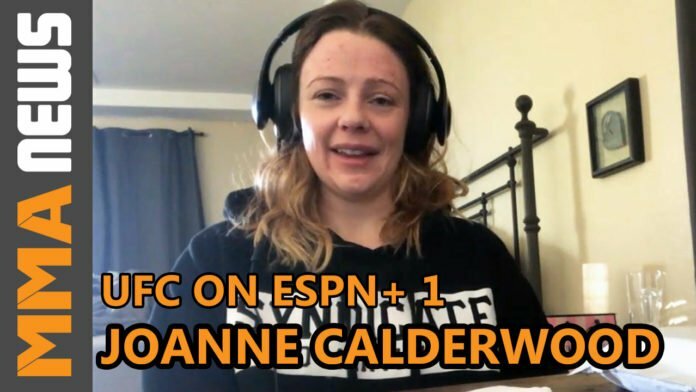 “It’s amazing,” Calderwood told MMA News. “I can now start having a healthy lifestyle not just outside of camp but in camp as well. Especially in this game you’ll find a lot of fighters blow up after fights and we shrink down [during fight camp] it causes a lot of stress on your body. I’m just grateful I have the knowledge now that I don’t have to do that anymore. I’m in a good place where I can be healthy year round and have abs year round, not just during fight week. Calderwood (12-3) only competed once this year but the time off allowed her to make a number of changes outside the cage. She linked up with top manager Daniel Rubenstien (Ruby Sports and Entertainment) who also reps the likes of Michael Chiesa, Mackenzie Dern and Sean O’Malley. She’s also settled into her new team over at Syndicate MMA in Las Vegas, which for the first time in her career has allowed her to train with women. The 32-year-old will now look for back-to-back wins for the first time since June 2016, when she meets KSW standout Ariane Lipski on Jan. 19 at UFC on ESPN+ 1. Despite the pair having similar records, Calderwood believes her caliber of opponents have been far higher than Lipski’s. Lipski (11-3) will be making her UFC debut and carries a nine-fight win streak into the octagon. The 24-year-old has finished seven of her nine opponents during that span, including five first-round stoppages. UFC on ESPN+1 takes place Jan. 19 at Barclays Center in Brooklyn, NY. Flyweight champion Henry Cejudo defends his title against bantamweight champion TJ Dillashaw in the main event.